With ActBlue Express Pass, your supporters can donate quickly and easily from a mobile device. They don’t have to type in a 16-digit credit card number and address with their thumbs on a small screen. If an ActBlue Express user with a mobile number associated with their account is contributing from a mobile form, we’ll offer them an ActBlue Express Pass. 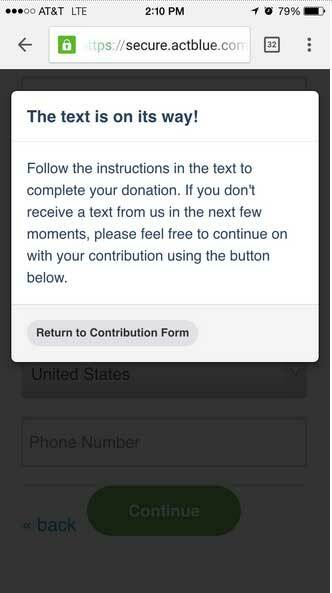 After they’ve selected a donation amount, typed in their email address, and moved on to fill out the rest of the form they’ll see a popup like the one below. We’ll remind them they’re an ActBlue Express user and offer to send them a text message where they can finish their contribution. Next, they’ll just need to click yes. 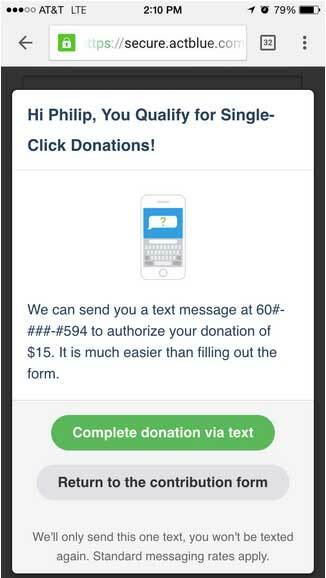 Donors receive the text message, click the link, and their contribution goes straight through. It’s that easy. If your campaign or organization has chosen a post-contribution action like a pop-up recurring box or customized redirect, ActBlue Express Pass users will enter that flow like any other user once their contribution processes. Otherwise, donors will see the thank you page like usual. If your campaign or organization already has ActBlue Express Lane enabled then you’re all set. ActBlue Express Pass is automatically turned on when ActBlue Express Lane is enabled for a campaign or organization. Please note that applicable donors will see ActBlue Express Pass on single entity and Tandem Forms, but not on event and merchandise forms. Those require extra info and will still get the regular mobile treatment.